Christina’s email address is no longer valid, but we still have a mailing list of people looking for either the monkey or the blanket. 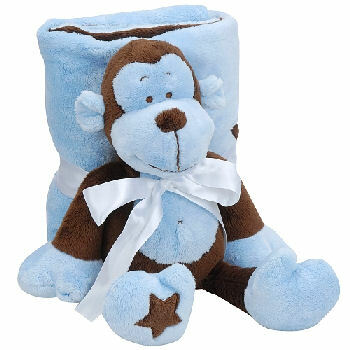 We are searching for a 10 inch brown and blue Koala Baby plush monkey with blue face, hands, belly, and feet and a brown star on one foot. It originally came with a blanket that we don’t need. My 2 year old just lost his monkey at the zoo. We checked Lost and Found at the zoo, and they still don’t have it. Yesterday he was running all over the house trying to find it and whining about it. He thinks it’s in the dryer! The poor little guy. My husband has already been to Babies ‘R Us to see if they still sold it, and I’ve looked everywhere online. All I could find was this site that had reviews for the monkey and blanket. If you can help Christina find this Koala Baby Brown & Blue Monkey with Star on Foot, THIS SITE IS NO LONGER ACTIVELY MANAGED. Please use Our FREE FACEBOOK GROUP, including the POST CODE #20253. Thank, Leann. I’ve sent it to the mailing list. I wish I had the luxury of buying it for 75.99! #20253 I am looking for a monkey exactly like this. My son has carried one like it since he was born and is now almost 3. It is falling apart and I need a replacement fast please help!!!!! Know price may still be a factor but with multiple people looking can’t hurt to know its here. ebay #150756849651 ends in 22 hours 1 bid at $10. Good luck all! ebay# 120845483277 $80 buy now.